The LC 500h has its own lighting signature with arrowhead daytime running lights. TOKYO -- Lexus is upgrading its hybrid drivetrain lineup with a new-generation system that adds a four-speed automatic transmission and semi-manual shifting for a sportier feel. The new technology, which the luxury brand calls the Multi Stage Hybrid System, will debut in the Lexus LC 500h hybrid sports coupe to be unveiled at the Geneva auto show next month. The LC 500 was unveiled at the Detroit show last month as the brand's flagship coupe. The hybrid version that will be shown in Geneva mates the gasoline engine to an electric motor and lithium ion battery, like previous hybrids in the brand's hybrid-heavy lineup. But it adds a four-speed automatic gearbox, which Lexus says will more closely align the engine's RPMs with the driver's input. The direct connection pushes the car from 0-100 kph (62mph) in under five seconds, the company said in a news release today. To offset the added weight of the four-speed automatic transmission, Lexus engineers devised a lighter, compact electric motor and lithium ion battery. The trick allows the new hybrid system to weigh in the same as the outgoing one. The hybrid version gets a 3.5-liter V-6 engine largely based on the power plant in the latest-generation RX crossover. The base gasoline version LC 500 gets a V-8 engine. 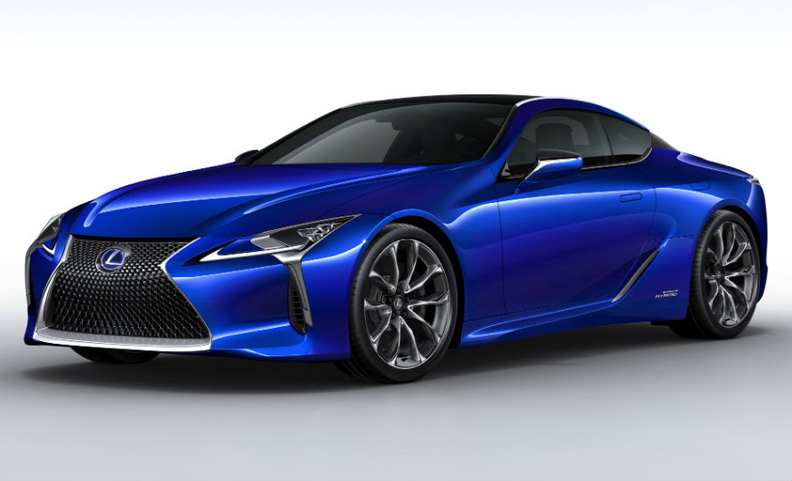 Shedding more pounds from the LC 500h, the car gets an aluminum front hood and fenders, aluminum door skins mounted on a carbon fiber structure, a carbon and glass composite boot lid, aluminum front suspension towers and ultra-compact LED headlamps. Forged alloy wheels and a carbon fiber roof are optioned.